Hi, I hope everyone is having a great week! 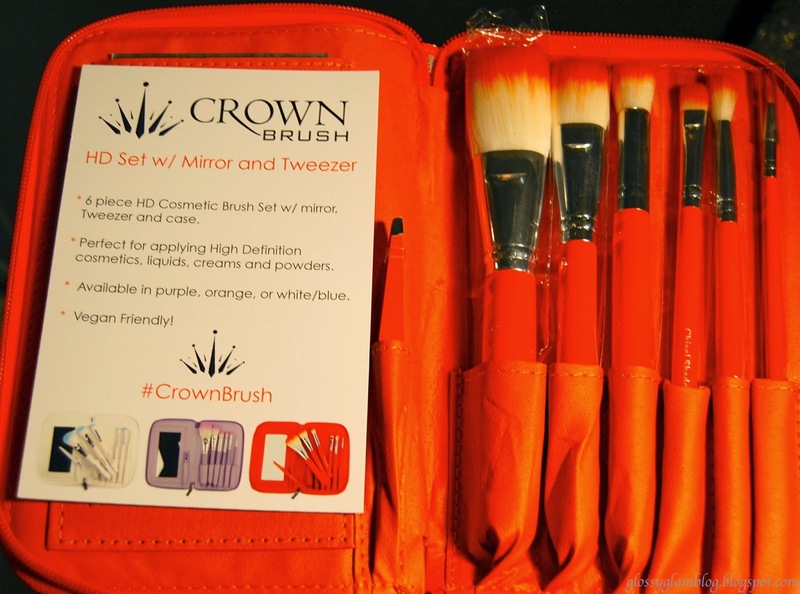 Today I'm going to talk about the Crown Brush HD Set with Mirror and Tweezers that I received from iFabbo. I had actually never even heard of this brand of brushes before, where have I been!?! These brushes have been around for 30 years and they are cruelty free and vegan. The set I received comes with 6 brushes and a pair of tweezers all in a cute orange case with a mirror. This set is also available in purple and white/blue. The description says that these brushes are perfect for applying high definition cosmetics, liquids, creams, and powders. This kit comes with a powder brush, tapered brush, deluxe contour brush, crease blender, chisel shadow, detail liner brush. I've washed these brushes and used them several times, none of the bristles fell out and the brushes are super soft! They pick up a nice amount of product and feel good on the skin. I've only tried these with powders so I can't attest to their claims that they are great for creams and liquids (for creams and liquids I use either my fingers or my beauty blender sponge). I would definitely recommend these brushes and another great thing is that they are reasonably priced. On the website right now, this kit is only $27.95 HERE! I'm so glad I was able to try these brushes out. *Although this is a sponsored post, all opinions are 100% honest and my own. I am glad you liked the set! Love the pictures you did on the mirrored surface! So creative! Oh, I was worried the pics on the mirror looked weird. So glad you liked them! I like your blog and am now following all your social medias! Thanks for stopping by! Thanks for sharing. I've been curious about Crown brush but haven't tried them. After reading your revie, I realize they sound like something I should try. I love the color on these brushes. Orange is such a fun color. Great review. I've been curious about this brand, they were recently on Hautelook and I decided to pass them up. I will definitely keep an eye for them again. Thanks for sharing! This is lovely!!! 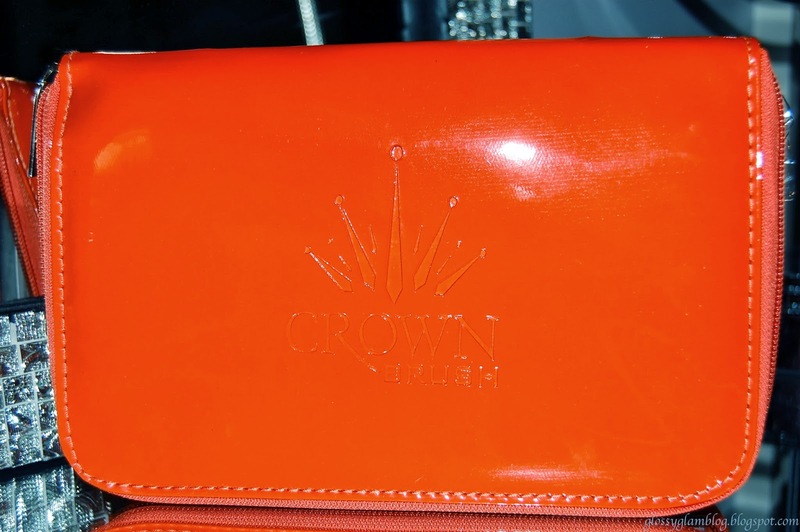 The set of brushes in my Giving Thanks giveaway is from Crown Brush too! I have one Crown Brush but plan to purchase more because it really is good! I have a flat top brush (similar to elf's powder brush). I used it today for the first time actually to apply my Revlon Nearly Naked liquid foundation, and it works beautifully! Oh yes, I have that ELF brush too and I like it. That brush would have been a nice addition to this basic set. Thanks for dropping by! Thanks, I really like your blog too! I am now a followers on bloglovin, twitter, and of fb! All my social media buttons are on my homepage, thanks! These brushes are on Hautelook all the time, and I've always passed them up because I didn't know how good the quality of them was. Definitely gonna check them out next time they're on! you def. should, they are soooo soft! thanks for dropping by! I think the orange color is so cute. Thanks for this brush review!